For the meatballs, finely chop some of the garlic and shallots. Heat oil in a large frying pan set over medium heat and sauté garlic and shallots for approx. 3 min., or until softened and fragrant. Set aside. Transfer the ground pork and beef to a large mixing bowl and add sautéed garlic and shallots, chili flakes, oregano, breadcrumbs, and milk. Season with salt and pepper to taste. Stir well and form walnut-sized balls with wet hands. Transfer to refrigerator to rest. While the meatballs are resting, chop remaining shallots and garlic and sauté in a saucepan with some of the olive oil. Add the crushed tomatoes, season with salt and pepper, and let it simmer. Heat remaining olive oil in the other large frying pan and fry meatballs on all sides for approx. 5 min., or until browned on all sides. Remove from heat and transfer to the tomato sauce. Let simmer for approx. 15 – 20 min. Boil salted water in a large saucepan and cook tagliatelle according to package instructions, until al dente. Drain pasta and add it to the tomato sauce. 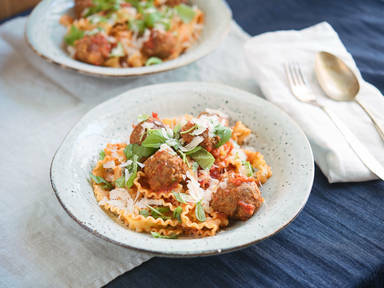 Stir well, transfer to serving plates, and garnish with basil and Parmesan cheese to taste. Enjoy!